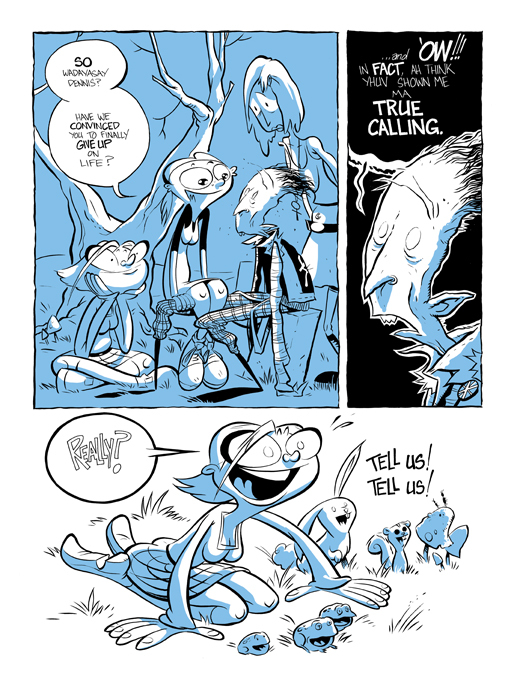 Troy Little is the creator of the acclaimed graphic novel Chiaroscuro and the newly released Angora Napkin (both published by IDW). His new graphic novel is currently in development by Teletoon Canada as an animated pilot. Little, who lives in Prince Edward Island, Canada, splits his time between comics, animation work, and tending to his young twin daughters. You can keep up with him on his blog at meanwhilestudios.blogspot.com. Originally I thought working in animation was going to be my dream job. I started working in the industry in 1996 drawing backgrounds for a number of kid’s cartoons. After a few years doing that I started trying to make my own animated shorts and even developed an idea for a cartoon series, Angora Napkin, with my friend Nick Cross. Eventually I kind of became soured towards working in television as I found it to be very creatively restrictive. Needing an outlet for my own ideas, I thought about making comics as a means to take control. I started Chiaroscuro in the fall of 1999 as a self-published series, thanks in part to the Xeric Foundation, and managed to publish seven issues before having to put the book on hiatus. 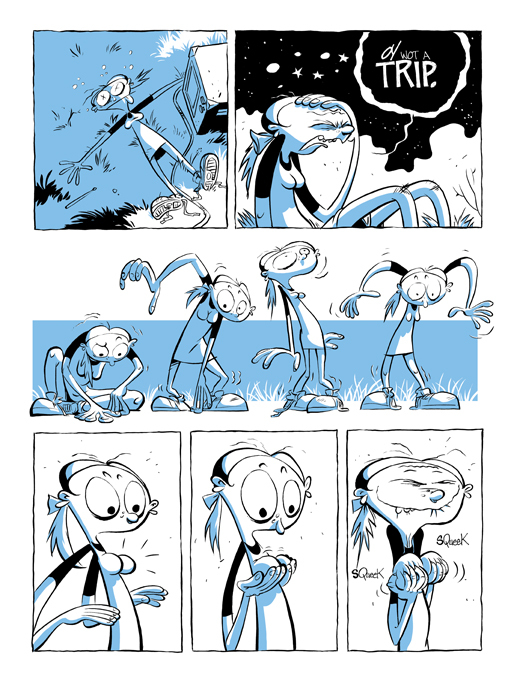 I really found comics to be an enjoyable means of telling stories and I felt liberated from my lofty position of “cog” working in animation. My father was a big influence on me becoming an artist. He would doodle these weird character heads on the corner of the TV Guide. To me, that was magic. You couldn’t wipe the grin off my face. As I grew up I always wanted to impress him with my drawings. He never overly praised my work but did encourage me so I tried harder and got better. He cautioned me only once — when I told him I wanted to go to art school — that there’s no pension or security in art — he’s ex-Air Force — and that I might have to support a family someday. Regardless, this was the only path that made sense to me. He’s been a proud supporter of my work ever since. Up until 2003 my comic had received lots of critical praise from a very small circle of fans and reviewers. 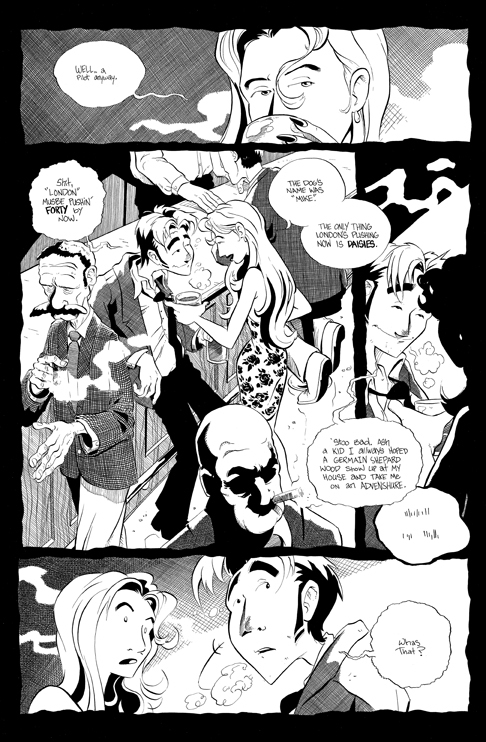 In 2005, I received a grant to complete what would become the graphic novel Chiaroscuro: Patchwork Book I. I produced a small print run of the collected work and sent it out to reviewers, publishers and industry folk in the hopes that something may come of it. It was met with the deafening sound of crickets for the most part. One person who did take to it was Dave Sim of Cerebus who wrote a very nice review of the book on his blog. 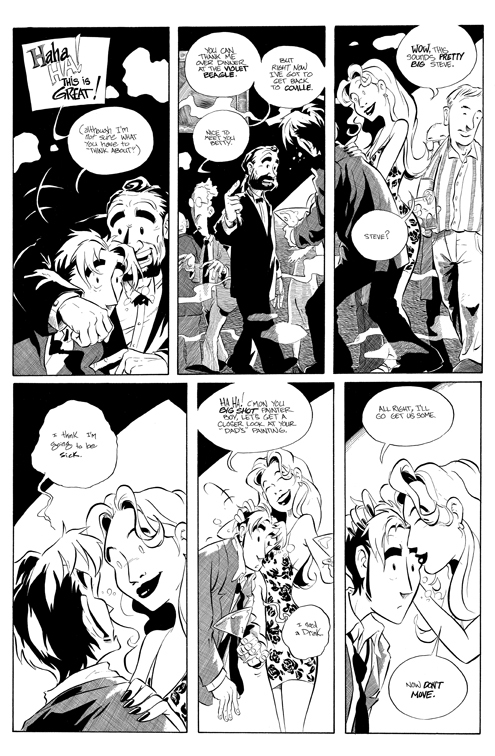 As anyone who’s seen Chiaroscuro can tell you, I’ve been heavily influenced by Cerebus and it was, in fact, Dave’s “Guide to Self-Publishing” that got me into making comics professionally in the first place. Dave’s review got the attention of IDW Publishing who then picked up the book and published a beautiful hardcover edition in 2007 with a trade paperback in 2008. I have a lot of respect for Dave and what he’s done for the small press. He’s by far my biggest influence in comics. I’m not sure, I haven’t stopped working long enough to do much re-charging lately, but I’m due. I used to read a lot, and I’m a big movie buff, so that’s a few things that have offered me a lot of enjoyment and sparked ideas in me historically. I assume they are still waiting for my return. It’s been a little haphazard since becoming a father to twins. I still have a day job in animation, too, so my routine consists of cramming in all my work after hours or before everyone wakes up. It’s pretty exhausting. As far as the actual process of creating comics, I have a lot of time to work out ideas in my head before I ever find the time to write anything down. Usually I’ll hit a coffee shop and do a lot of dialogue writing and note taking before I draw much of anything. Then I’ll plot out a number of pages in thumbnail form and do rough layouts from there. I don’t work too far ahead in case the pacing feels off or a good idea comes up in the actual process. I like to keep things organic and loose in that sense, it helps keep me interested in what I’m doing instead of just connecting the dots. Finally I re-draw or transfer the rough layouts onto good paper, tighten them up and hand letter and ink them. Any old spiral ring notebook works for writing. I’ll thumbnail and rough layout on photocopy paper. Final art goes on better paper, for Chiaroscuro I use S172 Illustration board and for the Angora Napkin book I used a heavy, smooth Bristol board. Inking changes for the project too, I use a Hunt 102 Crow Quill on the former book and a Pentel Brush Pen on the latter. I sometimes use Pilot pens for sketching or other comic stuff. All aspects have their good and bad bits. I like to switch what I’m doing so as not to get tired of doing the same thing. I like inking a lot. The finished art is usually the most satisfying to me. Having Chiaroscuro in print with IDW has been a very rewarding experience. It’s offered me a wider fan base and has given me a chance to travel and talk about my work at writers’ festivals and comic conventions. I’m also very excited about my next book Angora Napkin which is being made into a cartoon pilot that should air early in 2009. Personally, I wouldn’t wait around for someone to tell you you’re good enough before you make your own comics. Just make them, always try to improve and care about what you’re doing. Be relentless and never give up. Do everything for the right reasons and don’t care about what people may or may not think of you. If you love what you do, then life can be very enjoyable. I’m a big believer in the DIY approach to things. You can never fail by trying. Great interview. I admire Troy Little’s work, thanks for doing this feature.